Unfortunately, this post from three years ago is all too timely today, in August 2018. After record-breaking heat throughout the west, forests burst into flame, and smoke has filled the air. Our thoughts are especially with the folks in California and BC who are in the midst of one of their worst fire seasons ever. For beekeepers, what follows is a bit about fires, smoke, and bees. When I wrote this three years ago, I had no bees in the backyard. Now I do. The effect of this year’s heavy smoke is noticeable – the flight from the hives is just one-third to one-half of what it was a few days ago when there was no smoke. Calgary – a smoker’s haven. 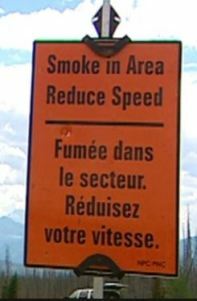 My home town – Calgary – is under a smoke advisory. The sky is hazy with smelly gray smoke from the trees, grass, and homes that are on fire down in Washington state. Those fires are about 700 kilometres (500 miles) away and on the other side of the Rockies, but you can see from the picture that the smoke has drifted to us. Considering the large number of fires in the drought-stricken Pacific Northwest and coastal areas, we have been lucky that the smoke has avoided us until today. This entry was posted in Beekeeping, Ecology, Honey, Reblogs, Uncategorized and tagged Alberta, bee smoker, Calgary, forest fires, pheromones, smoke. Bookmark the permalink. We’re in the midst of a LOT of smoke with the occasional not quite so smoky hour or so thrown in – for days now. As a result of the smoke cover the temps have also dropped. I stood watching my hive for awhile this morning…..there are still bees going out to forage – but there is a lot less activity outside the hive. No lounging about in the sunshine as there isn’t any. I think it’s the cooler temps to blame, not the smoke – though I’ll admit it’s sometimes harsh to breathe. In my area some beekeepers are blaming absconding on the smoke – not sure that’s valid…. Did not notice much change , just finished the second harvest , third looking good but will leave it in for the winter . We were able to actually completely dismantle the hives to check for disease without net , however the next day in dark t shirt they got me good . We had here a 30 to 40 degree below normal temperature , have yet to harvest one tomato . However 30 miles inland they have record heat = record fire and smoke .